(Newser) – The chairman of an Arizona rodeo was among two people critically injured when an event went badly wrong, authorities say. The Superstition Fire and Medical District says the incident occurred at the Lost Dutchman Days Rodeo in Apache Junction on Saturday, the Arizona Republic reports. 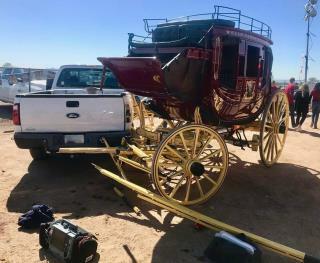 Witnesses say the stagecoach hit multiple vehicles after the horse team bolted from the arena. The rodeo committee says chairman Denny Walter, who was riding shotgun on the stagecoach, is still in intensive care "after the first of many surgeries to come." The committee says he wants to thank everybody for their support, and "there were many heroes who stepped up yesterday without a second thought of doubt." WHAT were those radicals thinking? Operating that unsafe vehicle without seatbelts, air bags, bumpers, horns, turn signals or collision avoidance systems ? The horror of it all ! The TRUE horror and shame is that we as a country are getting so protective and pampered that if a person on the opposite coast falls of their bicycle it will get reported and someone will have angst over it. "The Superstition Fire and Medical District says the incident occurred at the Lost Dutchman Days Rodeo in Apache Junction" Wow. Thats quite a sentence. Green horses, green driver= Disaster!